The NFL is the most popular professional sports league in the United States. Its athletes receive multimillion-dollar contracts and almost endless media attention. The league's most important game, the Super Bowl, is practically a national holiday. Making it to the NFL, however, is not about the promised land of fame and fortune. 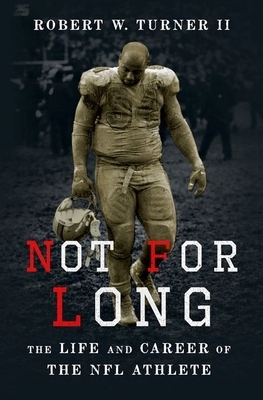 Robert W. Turner II draws on his personal experience as a former professional football player as well as interviews with more than 140 current and former NFL players to reveal what it means to be an athlete in the NFL and explain why so many players struggle with life after football. Without guaranteed contracts, the majority of players are forced out of the league after a few seasons. Over three-quarters of retirees experience bankruptcy or financial ruin, two-thirds live with chronic pain, and too many find themselves on the wrong side of the law. Robert W. Turner II argues that the fall from grace of so many players is no accident. The NFL, he contends, powerfully determines their experiences in and out of the league. The labor agreement provides little job security and few health and retirement benefits, and the owners refuse to share power with the players, making change difficult. And the process of becoming an elite football player--from high school to college and through the pros--leaves athletes with few marketable skills and little preparation for their first Sunday off the field. With compassion and objectivity, Not for Long reveals the life and mind of high school, college, and NFL athletes, shedding light on what might best help players transition successfully out of the sport. Robert W. Turner II earned his Ph.D. in sociology at the Graduate Center of the City University of New York. He is Assistant Professor of Clinical Research and Leadership at George Washington University. Dr. Turner played football professionally in the now defunct United States Football League, the Canadian Football League, and briefly in the National Football League.